Earn 359 loyalty points when you order this item. TEAC W-1200 Double Cassette Deck draws on TEAC’s proud heritage in creating world-class tape recorders, an authentic double cassette deck for the modern day. This double cassette deck features two, one-way cassette decks, mic mixing, a USB digital output and other versatile recording features. In recent times, cassette tapes have fascinated those who had never used them, thanks to their warm, distinctly analogue sound, not to mention the ease of recording and the ability to create ‘mix-tapes’. Both decks support the playback of Normal (Type I), Chrome (Type II), and Metal (Type IV) tapes, while supporting recording on Normal and Chrome-type tapes. 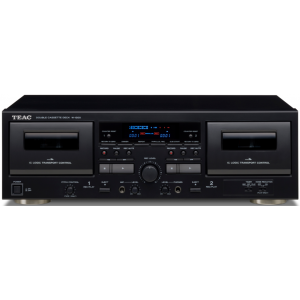 TEAC set out to create a cassette deck that combined an excellent level of performance with an interface that suits the digital audio era. Not only does the W-1200 offer sound that’s close to the original, it also has a wide range of versatile facilities that allow karaoke singing, the recording of conference minutes, and even the digital recording of analogue cassettes via a computer. TEAC's decades of experience in making recording equipment are self-evident in the W-1200, particularly where the noise reduction system is concerned. It allows users to play back legacy cassette tapes originally recorded with Dolby B NR and hear them correctly. Moreover, the pitch control allows you to change playback speed to whatever’s considered appropriate while the level meters provided enable fine-tuning of recording levels. A timer REC/PLAY function is provided to allow use with a third-party audio timer. Furthermore, the W-1200 can deliver digital audio at CD-quality (up to 48kHz/16-bit PCM) to a computer via a USB cable, allowing digital archiving of your cassette tape library. Once you’ve digitised them on a computer, you’re able to enjoy your old tape-based music library anytime anywhere via a network player, DAP, smartphone or even in your car. The built-in noise reduction system suppresses the hissing noise that inherent in cassette tape playback. This allows cassette tapes that were recorded using Dolby B NR in the past to be played back with sound quality that is close to the original. TAPE1 is equipped with a pitch control that changes playback speed (in order to restore the playback sound on old tapes to the original key) by allowing the adjustment of tape speed by ±12%. Moreover, by combining the Pitch control and A-B Repeat play, users are able to make voices easier to understand at reduced tape speeds when transcribing recorded meetings and speeches. Furthermore, both TAPE1 and TAPE2 are equipped with Return-to-Zero (RTZ) functions that make returning to them to their "0000" counter positions easy with the press of a single button. Parallel Recording makes a pair of identical tapes at the same time on TAPE1 and TAPE2. It is a convenient way to provide someone with a copy of a tape right after making a recording. The timer REC/Play ready allows users to record/playback tape when the W-1200 is turned on with a third-party audio timer. The W-1200 is not equipped with a built-in timer so a third-party audio timer is required. Devices that allow timer operation can be connected as sources. The dual mode REC MUTE function allows users to erase unnecessary sections and to add spaces (silences) between tracks while recording. During recording or rec-standby, the W-1200 creates a 4-second ‘blank’ (standard gap) between tracks simply by pressing the REC MUTE button once – press and hold it for more than 4 seconds and you can create a blank as long as you need. The mic input and mixing function allow users to mix mic sound and tape/aux sound, and to record mixed sound to a cassette tape. By adjusting the mic level, users are able to enjoy Karaoke performance, (useful for announcement-type applications) without an external mixer. Of course, recording the mic sound alone to a cassette tape is also supported. Combine that with the Parallel Recording facility and users can create a pair of identical tapes simultaneously, useful for making conference minutes, for example, one being the ‘master’ and another for distribution. With just the press of a button, users are able to duplicate cassette tapes, making a backup copy of the original tape. Users are also able to create silences between tracks by pressing the REC MUTE button during dubbing. This also serves as a simple editing system, by allowing the erasing of unwanted sections. A fluorescent display with high contrast and high brightness is employed to show - in one place - all the information needed to operate the decks, including Left and Right level meters for full-fledged recording plus independent tape counters tor TAPE1 and TAPE2. The dimmer function allows users to adjust the brightness according to the environment. The built-in A/D converter and a USB digital output on the rear panel allows users to digitally archive their cassette tape libraries, at 48kHz/16-bit CD-quality. The sampling frequency and bit depth are selectable from 8k to 48kHz and 8 or 16 bit, depending on recording quality of the original tape. Once a digital archive is created, users are able to listen to them anytime anywhere with a computer, DAP, smartphone, network player or even in a car.